An informative presentation through which you seek to inform the audience of the brilliance and sheer size of the cosmos requires a template that incorporates a space theme. 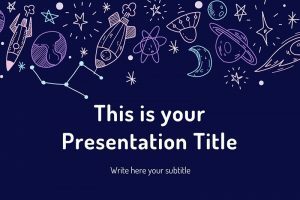 Download the Free Space PowerPoint Templates now to gain access to templates that feature enigmatic space themed backdrops accompanied by darker hues. The templates boast a high degree of customizability, allowing users to easily and quickly change the layout of each slide by simply dragging and dropping commands. The text and image input fields are easy to use, and provide you with ample space to write statistical data or insert images of other space-themed objects, information or findings.